This bike was stolen from Davis california about a month ago. Fox build with i9 wheels and bent fork. Any clues would be greatly appreciated and there will be a reward if the bike is recovered. Thanks! 2017 Rocky Mountain Vertex STOLEN! Stolen out of central Austin, Texas. Will give $1000 reward if returned, no questions asked. Was biking on Hornby Island March 18th. We stopped off at the Coast Resort Bistro in Parksville for a bite to eat and 2 bikes were stolen off the rack of my truck. An XL Turner Czar, Next cranks, LB carbon wheels, Chris King hubs, BB, headset. Stolen from our garage in Calgary in the last 24 hours - was hanging on my wall RP23 Shock installed, and a while FSA headset Most obvious distinguishing marking is a scratch/chip on the right upper side of the head tube - see pics. 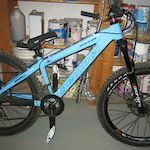 I got my silver 2013 Banshee rüne stolen from Milwaukie, OR, just south of Portland. $100 reward. My Masi Giramondo 27.5 was stolen in Columbus OH. Any leads would be appreciated. This has been reported to the police. If you spot it, please reach out. I do not have the ability to replace this bike.